We are saved by faith when we trust that Jesus died for our sins. This is the gospel, or so we are taught. But what is faith? And does this accurately summarize the gospel? Because faith is frequently misunderstood and the climax of the gospel misidentified, the gospel's full power remains untapped. 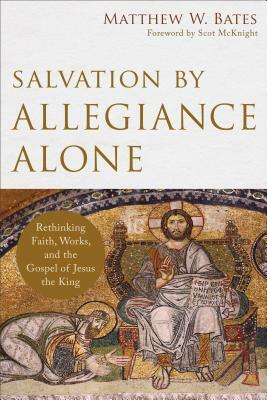 While offering a fresh proposal for what faith means within a biblical theology of salvation, Matthew Bates presses the church toward a new precision: we are saved solely by allegiance to Jesus the king. Instead of faith alone, Christians must speak about salvation by allegiance alone. The book includes discussion questions for students, pastors, and church groups and a foreword by Scot McKnight. Matthew W. Bates (PhD, University of Notre Dame) is assistant professor of theology at Quincy University in Quincy, Illinois. He is the author of The Hermeneutics of the Apostolic Proclamation and The Birth of the Trinity.